Note: This page was written in 2009 before the Widespread use of TuneECU, which seems to be the best and cheapest way of re-mapping your Futura. A Power Commander or TubeBoy may no longer be a viable idea but I’ve left the info here just in case. The Sagem ECU fitted to the Aprilia RST1000 Futura is not directly re-programmeable, so if you want to do any tuning, you need to add something else to override it. Use the link on the right to do direct to Power Commander III and Tuneboy maps. 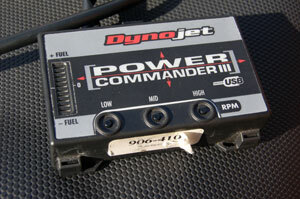 There are two ways to do this – either a Dynojet Power Commander or a Tuneboy. Both are quite different animals, even though they do the same basic job. Each has a control box that taps into the fuel injection system and sits somewhere on the bike, usually under the seat. Since 2010 another method of tuning a Futura has emerged and appears to be cheaper and simpler. You can find the information you need on this on the Apriliaforum thread Improving 05 Mapping with TuneECU. You don’t necessarily, unless you have made modifications to the air induction or the exhaust system. Most riders find the stock map, and especially the 05 map, is fine for most conditions, though most bikes run rich with it. Soot around the exhaust is a giveaway. But if you make mods to the air intake or the airbox, and especially if you replace the pre-silencer or the end cans, you may find flat spots in the power delivery – where the bike hesitates before taking off. These are caused by fuel starvation i.e. the engine is not getting enough fuel. Each of them allows you to control the amount of fuel the ECU delivers to the bike under various engine speeds and throttle openings. But while a Power Commander does this on a very basic level, Tuneboy allows a far greater level of control, and allows you to control far more parameters. So in short, if you lack confidence and experience in fuel injection systems, the Power Commander is probably the way to go. If, on the other hand, you know what you are doing, then maybe Tuneboy is for you. Be warned, though, that while the Tuneboy allows you to adjust much more, it also gives you the freedom to totally mess up your bike’s fuelling – and possibly cause engine damage. Both are available in USB versions, which means you can hook them up to a laptop to upload a new map, and even create your own on your computer. Whether you have a Tuneboy or a Power Commander, there’s only one way to set the bike up properly and that’s to have a custom map created on a dyno. Every bike is different and behaves differently and the only way to tell what’s happening is to analyse the exhaust gases and have a custom map done on a dyno with someone who knows what they are doing. But this can be expensive, and you can get pretty good results from using someone else’s map – if only as a starting point. Note: Dynojet suggest you fit the PCIII in the tool tray under the seat, but you can also fit it inside the rear subframe rail.